Blurts requires software applications installed on your BlackBerry and on your computer. The BlackBerry software can be downloaded and installed directly to your BlackBerry by browsing to m.mlhsoftware.com on your BlackBerry. The computer software can be download from the Blurts download page. Once both applications are installed you need to setup the Bluetooth connection between your BlackBerry and computer. This is also known as "pairing". There are different ways to pair your BlackBerry and computer depending on the type of Bluetooth software you have on your computer. Blurts can directly connect to your BlackBerry via bluetooth address if your computer is using the Microsoft Bluetooth software. When you open the Blurts options screen and see BlackBerry and Address as fields on the Bluetooth tab, your computer is using the Microsoft Bluetooth software. Click here for steps to connect your BlackBerry and computer using bluetooth address. 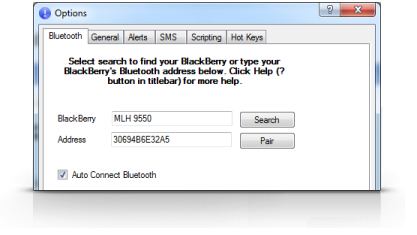 If your computer is not using the Microsoft Bluetooth software, Blurts can connect to your BlackBerry by using a virtual COM port. When you open the Blurts options screen and see COM Port fields on the Bluetooth tab, you will need to create a COM port for Blurts. 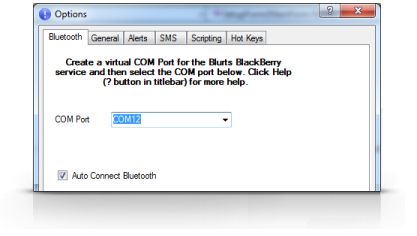 Click here for steps to connect your BlackBerry and computer using virtual COM port. 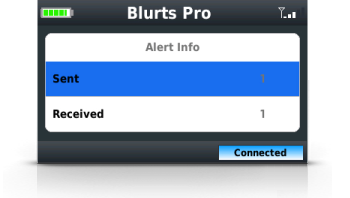 Once you have your BlackBerry and computer connected, you need to confirm that the Blurts applications are actually connected to each other and are working. Confirm that the Blurts icon in the Windows Notification Area is blue (not red) and the Blurts status bar on your BlackBerry says Connected with a blue background. If both are not connected then your bluetooth connection is not setup correctly. Try setting up your Bluetooth connection again. 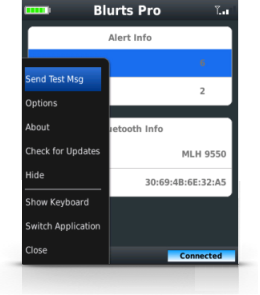 Confirm that your BlackBerry can send alerts to your computer by selecting the Send Test Msg menu option on your BlackBerry. You should see an alert display on the computer that reads "Blurts test message!". If you do not see this alert, then your bluetooth connection is not setup correctly. Try setting up your Bluetooth connection again. 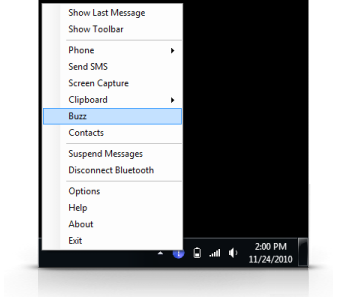 Confirm that your computer can send alerts to your BlackBerry by selecting the Buzz menu option on your computer. Your BlackBerry should vibrate. If your BlackBerry does not vibrate, then your bluetooth connection is not setup correctly. Try setting up your Bluetooth connection again. If you were able to send a test message and buzz your BlackBerry, Blurts is setup and connected correctly. Enjoy Blurts and please provide us your suggestions and feedback at feedback@mlhsoftware.com.